Santos, whose contract with the Greek federation will end in the coming days, admits that passage to the last eight won't be easy. RECIFE: Greece coach Fernando Santos has encouraged his team to "create history" as they aim to stretch their World Cup run into the quarter-finals by beating Costa Rica on Sunday. Greece squeezed into the knockout phase for the first time in their history after a last-gasp Georgios Samaras penalty secured a decisive 2-1 win over Ivory Coast last week. "This is an opportunity for us to go on and create history," said 59-year-old Portuguese Santos, who built a solid reputation coaching Greek giants AEK, Panathinaikos and PAOK before taking over the national reins in 2010. But Santos, whose contract with the Greek federation will end in the coming days, admits passage to the last eight won't be easy. Costa Rica's blend of pacy, counter-attacking football helped them upset predictions by winning Group D following wins over Uruguay and Italy and a scoreless draw against England. And the central Americans are expected to benefit from plenty of local support, on top of their large travelling army of fans, when Sunday's game kicks off in Recife. "I expect it to be a very tough game," added Santos. "They've already shown they are a strong team, and team is the operative word. Collectively, they are very effective. "But we'll be ready for them. If we want to advance to the quarter-finals, and we do want to, we have to be better than them in key aspects of the game. "We have to create opportunities, but we also have to pay attention to their counter-attack." Greece followed a disastrous 3-0 opening defeat to Colombia with a scoreless draw against Japan before rescuing their hopes with an unlikely place in the second round when Celtic striker Samaras coolly converted from the spot against Ivory Coast. "Our achievement has given lot of joy to people back home, but we're not ready to stop here." 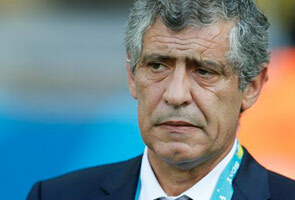 The approaches of both Santos and Costa Rica counterpart Jorge Luis Pinto, meanwhile, could not be more in contrast. While Pinto admitted he has spent hours watching "30 matches" involving players from the Greek national squad, Santos's approach is rather more Mediterranean in nature. Asked if he had paid special attention to the likes of Costa Rica's Joel Campbell, who plays on loan for Greek giants Olympiakos, he replied: "I don't analyse individual players. I don't analyse my own, or the opposition's. "Of course, you can always point to one single player but the whole team is what I focus on." Santos, however, insisted he was not taking 'Los Ticos' lightly. "If you pay attention to football, you know how strong Costa Rica are as a team," he added. "This Costa Rican team reminds me of the Greek team of 2004 that won the European championships. "That's one more reason we have to look out for them. If they're at this stage, it's because they deserve to be."